Upcycling is one of my favorite activities. I love breathing new life into something old. But I never really thought about applying that technique to nature. There are so many ways to repurpose things in nature — like an old tree stump. And when I saw just how many creative ways there were to use tree stumps, I knew that I had to try one (or more) of these DIY projects. Whether turning a tree stump into a piece of furniture, something functional, or something decorative, the possibilities really do seem endless. And depending on the finish you give to the stump, it could live inside or outside. These DIY transformations are perfect for someone like me because they are easy and inexpensive. Plus, they will add an amazing rustic flair to any home that will certainly be a conversation starter for friends and family. Scroll through to see these unique ideas. Will you be trying any of these for your home? Let us know in the comments! Please SHARE if you love these creative new uses for tree stumps! 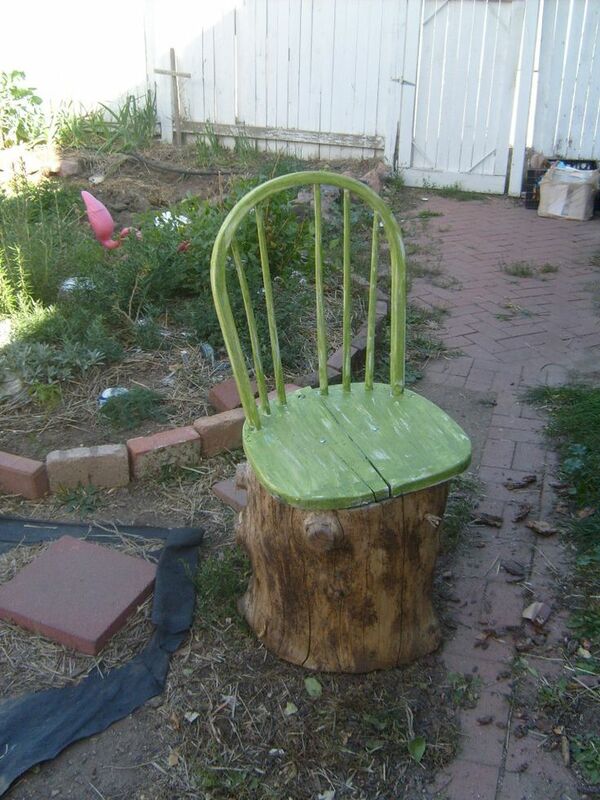 Transform your stump into a rustic backyard seat! Enjoy sitting in your garden or around the firepit with this DIY tree trunk chair. Use a small part of an old tree trunk to light your living room with this cool tree stump lamp! Add tiles to the tops of your stumps to make beautiful mosaics! This is the perfect decoration for your garden, or they can be used as outdoor seating. While we're on furniture, make yourself the perfect outdoor table! Why waste a tree stump when you can use it for backyard dining? If you get really ambitious, you can make your family a homemade jungle gym. While this may take a little longer than some of the other projects, the result is stunning! If you find yourself with a longer fallen log, this tree trunk bench will make the perfect addition to your backyard. It's great for sitting around the campfire eating s'mores! You can add the perfect rustic touch to your home with a simple tree stump flower planter! Or, if your stump is too big, make a planter by hollowing out the trunk and planting your favorite flowers. This is a gorgeous addition to any yard or garden! Give your tree stump a beautiful finish and transform it into a bathroom sink! This cool rustic piece is perfect for a cabin or country home. Serve your guests a snack or a cocktail on a tree stump tray! This easy-to-make project is sure to impress your friends. Spice up your backyard barbecue with some cool hollowed-out tree stump candles! If you've got a longer, narrower piece of tree, impress your neighbors with this creative tree stump mailbox! This creative idea of stacking giant trunks in the backyard is great for a family slide for the kids to play on! If you're giving your wedding a rustic feel, try this wedding cake platter made from a finished trunk! With the proper tools and safety elements in place, this tree stump firepit is a great addition to the backyard for those gorgeous summer nights! This creative use of stumps to make a vertical garden is beautiful and fun for anyone with a green thumb! While it may not be functional, this tree stump "drum set" is a great, cool-looking backyard project for any music lover! Which of these tree transformations did you like best? Let us know in the comments!